Taipei, April 14 (CNA) A long line of voters waited outside a polling station near Taipei Main Station as absentee voting kicked off Sunday, three days before Indonesia’s 2019 general election. Indonesians in Taiwan could vote for their president, vice president and members of the People’s Consultative Assembly in the general election from 8 a.m.-6 p.m. at 34 polling stations set up across the island. 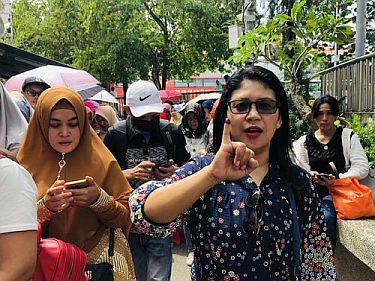 Outside the polling station in front of an Indonesian grocery store on Beiping West Road, close to Taipei Main Station, there was a 100-meter line of voters waiting early Sunday when the polling station opened, according to a local restaurant worker.